A shocking news in Michigan where a 75-year-old Grandmother was sentenced to 22 to 40 years in prison. Sandra Layne shot her 17-year-old grandson Jonathan to death, six times, last year, according to report by NBC News site. 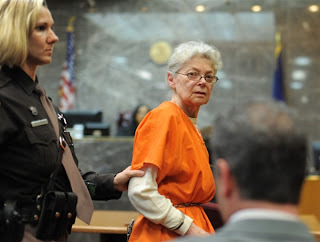 Sandra Layne leaving in West Bloomfield Township, Mich., was convicted last month for second-degree murder. Oakland County Circuit Judge Denise Langford Morris said, "Grandmothers are supposed to protect. ... Why did you keep shooting and how could you keep shooting?," Jurors declined her claim of self-defense. While Jonathan's mother, Jennifer Hoffman said, "I wish I had seen signs of how evil she was before I left her with my son,"
Sandra Layne said, "I'm sorry for what I did. I apologize to everyone I've hurt, everyone. ... Sorry is too small a word," she added, "I don't want to die in jail or prison." According to Layne's attorney, Jerome Sabbota planned to appeal after the hearing. Meanwhile, Layne's daughter, Jennifer Hoffman, urged the judge to show no mercy, according to report by ABC News site. Comments or suggestions about "75-year-old woman gets 22 years in Michigan's prison" is important to us, you may share it by using the comment box below.